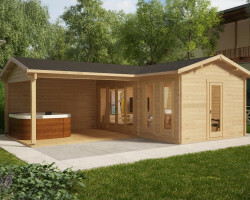 Our summer houses and garden sheds with a veranda or a terrace are made to enjoy warm summer days and nights. 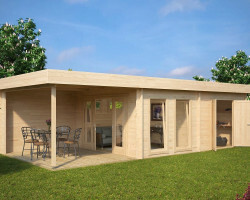 These smart garden buildings are made for setting up a great garden lounge to entertain your friends and family. Most of these summer houses with large terraces come with proper canopy to make sure that a sudden rain will not spoil your garden party. 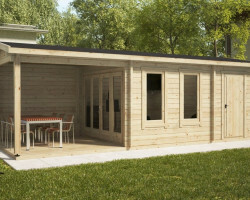 If you are looking to buy a summer house or a garden room with veranda, then you have come to the right place! 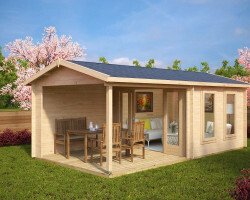 All our sheds and summer houses with verandas are made of the finest slow grown Nordic spruce, which is one of the best timbers to use. 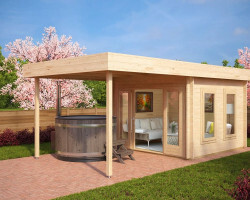 These contemporary garden buildings are an easy one to three-day DIY assembly for two persons. 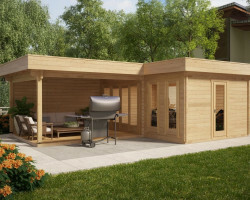 After your shed with veranda has been installed, it is time to let your fantasies run wild to create your perfect garden lounge with trendy furniture and decorations. 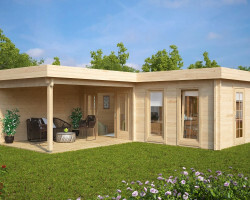 The most popular ones are spacious garden rooms with large verandas to accommodate a sofa, deck chairs, and a dining area. Where possible, we are trying to avoid small verandas with tiny space for a small table and couple of chairs. Instead, we include large and proper verandas sufficient for dining and spending quality time outdoors with your friends and family. 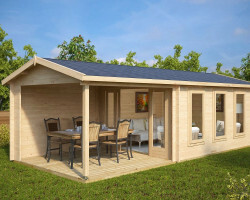 All our garden summer houses with verandas have solid wooden terrace boards included in standard price as well as a canopy to smile to a sudden rain. 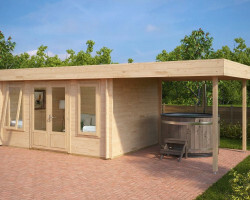 If your favorite Hansa Garden log cabin has no terrace, it is an easy DIY project to add it. 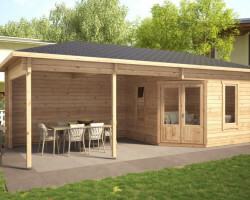 To make it even easier, you can buy extra foundations, beams, and wooden terrace boards together with your garden summer house. Just send us the measurements of your desired terrace and we will come up with an attractive offer. 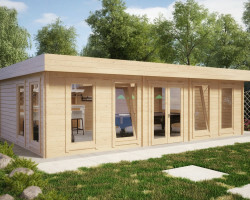 This is the smart way to build a summer house with terrace and save your time and money. 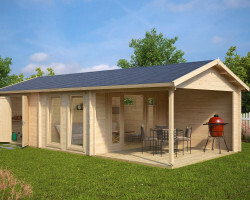 Garden sheds and summer houses with large verandas have been our top priorities over the last couple of years. They are designed to improve people’s garden life.